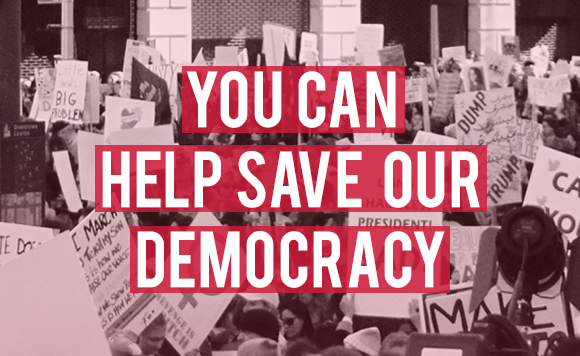 Join the Fight for Our Democracy – Donate Today! Your gift to Free Speech For People will help defend our democracy and our Constitution for we, the people, as we work together to challenge corruption at the highest levels of government and defend the promise of political equality for all. Your donation today will support our campaign to decharter The Trump Organization, our work helping to lead the campaign to impeach President Donald Trump, our legal challenges to limit the power of corporations in our political system and take on big money in politics, and our grassroots campaign to pass a Constitutional amendment to overturn Citizens United. Free Speech For People is a 501c3 organization and donations are fully tax-deductible. To make a contribution by check please email contact@freespeechforpeople.org.